Taking the lid off of my vanilla extract bottle is a simple but wonderful pleasure for me – oh, the aroma! When we were writing our cookbook last fall I started a batch of my own vanilla extract and have been so pleased with the results. And while the Krauses have not been doing much cooking at home recently (our kitchen hasn’t been put back together from the Esquina move), I do slip a bit of this treasure in pancake batter, whipped cream, and cookie dough. I’m including the recipe we wrote for the book, a great and simple recipe mind you, but one that did not make the cut from 300 recipes to 100. Maybe it will make it into the volume two cookbook I dream about, and if so, you will have had it very early! The fragrant, intoxicating aroma of fresh vanilla bean is both warming and uplifting. When brought with some sweetness and liquor, we are left with a really good thing! The application recipe prepares a homemade vanilla extract, perfect for all sorts of baking applications, as well as flavoring whipped creams and drinks like hot chocolate. Using the same basic formula of infusing, but with half as many vanilla beans, will make a nice vanilla infused liquor. These combination pairs nicely with chocolate, coffee, and cream. VANILLA – Madagascar beans contain a powerful full flavor and a nice dark color. Choose these for the most impact. The Tahitian variety are more fruity and floral – with a hint of fig flavor. These provide a nice complexity. Mexican beans contain a suggestion of sweet creaminess, which lends itself to desserts nicely. Look to online purveyors for buying beans in bulk, making them far less expensive. Also, consider approaching your favorite bakery or restaurant about purchasing some from them (when businesses buy in bulk, they often need to turn over their inventory and might be a good opportunity for you). SUGAR – In the application recipe, corn syrup is used to assist in extracting and developing the flavor in the vanilla. Corn syrup dissolves easiest in the liquid, but granulated sugar could also be used, but we sure to be thorough in shaking the extract. A bit of brown sugar could intensify an infusion with a darker liquor like bourbon or scotch. LIQUOR – For the most mild canvas on which to apply the flavors, use your favorite vodka. Using a white rum or white tequila will bring a more pronounced alcohol flavor, while being overall light in color. Really go for a deep and complex flavor with a brandy, scotch, or bourbon. Don’t use vanilla flavored liquors sold at your liquor store, which don’t capture the pure vanilla flavor. Using pure vanilla extract, which we repeatedly tell you in these pages is a must when compared to the artificial extract, is an investment. It can be expensive and is often sold in ridiculously small bottles that encourages hording. Instead, make your own! It’s simple to do, richly fragrant, and less expensive. 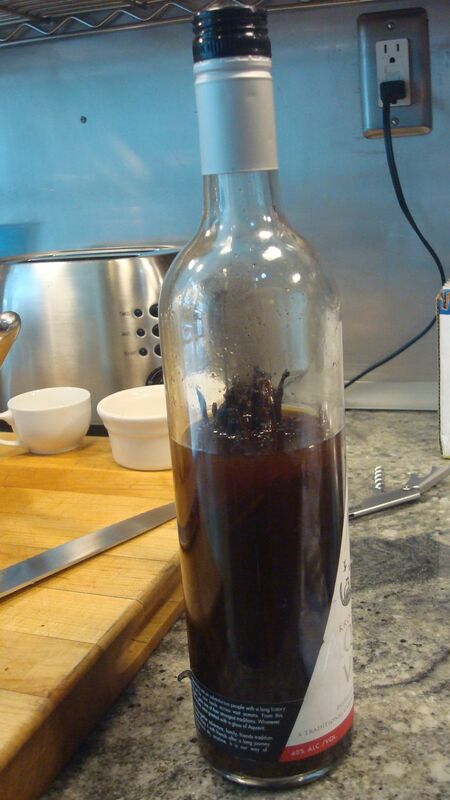 Place vanilla seeds, pods, and corn syrup in the bottle or jar. Cover with the chosen liquor, cover with lid, and give a good shake. Keep in a dark spot, shaking every couple of days, for 2 months. The liquid will become dark and richly fragrant. Use directly from the jar, or separate part of it in a small container for daily use. You may get some seeds mixed in, which will only improve the flavor. As time goes by and you use the extract, top of with liquor and add an occasional vanilla bean to it (it is a great use for beans you have scraped the seeds out of but are not using the pod). If continually topped off, the extract will keep indefinitely. When will your new place open near Washburn University? I work at Washburn. This recipe is just what I need in my kitchen. Thanks for posting!